Notes: Additional information for this issue came from an index done by Doug Kendig for the apazine, APA-I (August 2004 mailing). On sale date from the publication date found in the Catalog of Copyright Entries, Part 2, Periodicals, New Series, Volume 34, 1939, Number 3. Second class permit. Copyright number 427666. Copyright given to Whitman Publishing Co. Credits: Script: Merrill Blosser? | Pencils: Merrill Blosser? | Inks: Merrill Blosser? | Letters: Merrill Blosser? Credits: Script: Norman Marsh | Pencils: Norman Marsh | Inks: Norman Marsh | Letters: Norman Marsh? 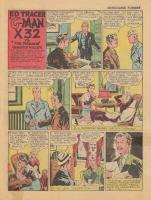 Credits: Script: Fred Harman | Pencils: Fred Harman | Inks: Fred Harman | Letters: Fred Harman? Credits: Script: Merrill Blosser | Pencils: Merrill Blosser | Inks: Merrill Blosser | Letters: Merrill Blosser? Credits: Script: Edgar Everett Martin | Pencils: Edgar Everett Martin | Inks: Edgar Everett Martin | Letters: Edgar Everett Martin? Synopsis: Two panel of the Major at the boarding house. Credits: Script: Virginia Krausmann | Pencils: Virginia Krausmann | Inks: Virginia Krausmann | Letters: Virginia Krausmann? Synopsis: Speed Bolton's adventures in China. Credits: Script: Martha Orr | Pencils: Martha Orr | Inks: Martha Orr | Letters: Martha Orr? Credits: Script: Jim Stevens | Pencils: Jim Stevens | Inks: Jim Stevens | Letters: Jim Stevens? Credits: Script: J.R. Williams | Pencils: J.R. Williams | Inks: J.R. Williams | Letters: J.R. Williams? Credits: Script: Sylvia | Pencils: Sylvia | Inks: Sylvia | Letters: Sylvia? Synopsis: Naval adventures of Don and his friend Red. 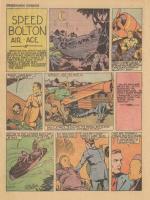 Credits: Script: Roy Crane | Pencils: Roy Crane | Inks: Roy Crane | Letters: Roy Crane?